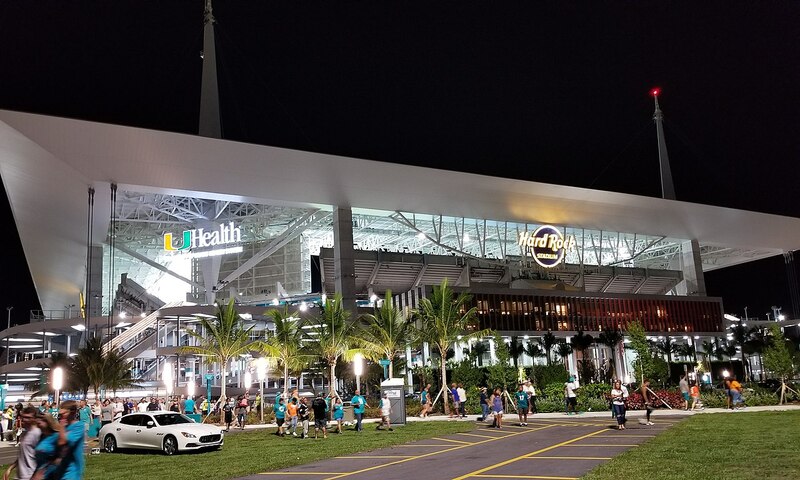 Construction linking pedestrians to Hard Rock Stadium is a go, as Miami-Dade lawmakers have granted an aerial easement allowing one of two planned foot bridges to be built over a county-owned roadway in Miami Gardens. By September – just in time for the onset of the NFL regular season and five months before the stadium hosts Super Bowl LIV – the bridges over an adjacent Florida Turnpike exit and Northwest 199th Street (Dan Marino Boulevard) should be done, county, city and project documents show, as should two tunnels under Don Shula Drive. Bentley Architects & Engineers is designing the new facilities and Condotte America Inc. will build the structures, project senior public information specialist Tasha Cunningham said, confirming that construction began on-schedule in January. No county consent was needed for the Turnpike bridge, she added, because it’s not a Miami-Dade right-of-way. Funding will come from an agreement between the Florida Department of Transportation and the city. County commissioners approved the overhead allowance last week, close to three years after Miami Gardens’ city council voted 6-0 to urge state transportation departments to “provide and expedite funding and permitting” for construction. At the time, Hard Rock Stadium – then Dolphin Stadium – was undergoing $450 million in privately funded renovation. The landmark sports site, projected to host about 2 million visitors and generate more than $13 million in sales tax revenues for the state, remains the largest sports and entertainment complex in the county. I would like to see a push for the Metro-Rail north extension to serve this stadium. It would be a huge boost for Metro-Rail passenger numbers and keep thousands of cars off the roads on game day and other events held on-site.